Sorry folks, but I can't reveal the exact location. Its on private property and a bit trecherous to reach. The owner doesn't want someone breaking a leg. That said this waterfall is not reported by anyone else and doesn't seem to appear on any lists of waterfalls. 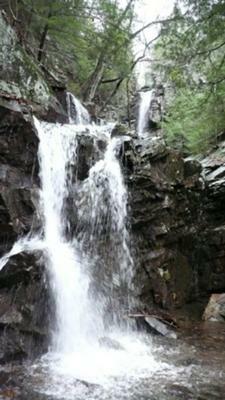 The waterfall freefalls about 40' then cascades down to another 12' drop. It is magnificent.